Reading and share top 25 famous quotes and sayings about Sea Shores by famous authors and people. Browse top 25 famous quotes and sayings about Sea Shores by most favorite authors. 1. 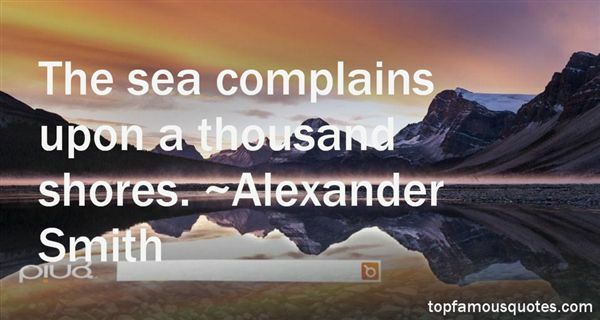 "The sea complains upon a thousand shores." 2. "The tide will turn, Miss Willow." A smile lurked around his mouth, but no, that was not possible, that the earl of Tiern-Cope should smile, and at her. "It hasn't yet. ""You may find the sea casts you onto the shores of paradise." His voice was low and soft, and Olivia felt her heart stir at the sound. "Or through the very gates of hell. ""So it might." She gave herself a mental shake. Lord Tiern-Cope could not possibly be flirting with her. Impossible. "But that won't stop me from embracing this moment in all its beautiful perfection. ""With but one flaw, Miss Willow. ""Whatever could that be? ""Don't even try to tell me I don't spoil the present perfection of your moment." The corner of his lip twitched and then gave up. He smiled, and she, perverse creature that she was, felt like she'd been tossed off a cliff with him standing at the bottom to catch her." 3. "The Waterfall and the Sea""Her love and passion are a waterfall, fed from the wellspring of her heart,gently tumbling into a pool, preparing herself to share her gifts.His passion and love are like the sea, deep and wide, waiting mysteriously,Patiently he awaits her, calling out through time and spaceShe hears his call, her pool overflowing.Her love and passion gushing over her banks she rushes toward himWinding and twisting she finds her way, destined to reach his shoresHe awaits her arrival as she opens her delta and his tide comes inTheir waters mingle every molecule of her river with his seaForever mixing and sharing their passion and love in that place betweenThe Waterfall and the Sea"
4. "For now the world keeps turning and I keep breathing, in and out, in and out. I breathe in the life that is all around me, in this garden, in this city, in the fields beyond it, in the seas beyond them and the shores on the other side; life that reaches out towards the unreachable, unknowable space that is beyond all of us and the stars that burn there." 5. "Her gaze dims as her nostalgia for Palermo overcomes her. Those smells of seaweed dried by the sun, of capers, of ripe figs, she will never find them anywhere else; those burnt and scented shores, those waves slowly breaking, jasmine petals flaking in the sun." 6. "Official education was telling people almost nothing of the nature of all those things on the seashores, and in the redwood forests, in the deserts and in the plains." 7. "And the ship went out into the High Sea and passed into the West, until at last on a night of rain Frodo smelled a sweet fragrance on the air and heard the sound of singing that came over the water. And then it seemed to him that as in his dream in the house of Bombadil, the grey rain-curtain turned all to silver glass and was rolled back, and he beheld white shores and beyond them a far green country under a swift sunrise." 8. "But to Sam the evening deepened to darkness as he stood at the Haven; and as he looked at the grey sea he saw only a shadow in the waters that was soon lost in the West. There he stood far into the night, hearing only the sigh and murmur of the waves on the shores of Middle-Earth, and the sound of them sank deep into his heart." 9. "(about sailors) Their minds are of the stay-at-home order, and their home is always with them - the ship; and so is their country - the sea. One ship is very much like another, and the sea is always the same. In the immutability of their surroundings the foreign shores, the foreign faces, the changing immensity of life, glide past, veiled not by a sense of mystery but by a slightly disdainful ignorance; for there is nothing mysterious to a seaman unless it be the sea itself, which is the mistress of his existence and as inscrutable as Destiny. For the rest, after his hours of work, a casual stroll or a casual spree on shore suffices to unfold for him the secret of a whole continent, and generally he finds the secret not worth knowing. The yarns of seamen have a direct simplicity, the whole meaning of which lies within the shell of a cracked nut." 10. "The NELLIE, a cruising yawl, swung to her anchor without a flutter of the sails, and was at rest. The flood had made, the wind was nearly calm, and being bound down the river, the only thing for it was to come to and wait for the turn of the tide. The sea-reach of the Thames stretched before us like the beginning of an interminable waterway. In the offing the sea and the sky were welded together without a joint, and in the luminous space the tanned sails of the barges drifting up with the tide seemed to stand still in red clusters of canvas sharply peaked, with gleams of varnished sprits. A haze rested on the low shores that ran out to sea in vanishing flatness. The air was dark above Gravesend, and farther back still seemed condensed into a mournful gloom, brooding motionless over the biggest, and the greatest, town on earth." 11. "Then Almitra spoke again and said, and what of Marriage master? And he answered saying: You were born together, and together you shall be forevermore. You shall be together when the white wings of death scatter your days. Ay, you shall be together even in the silent memory of God. But let there be spaces in your togetherness, and let the winds of the heavens dance between you. Love one another, but make not a bond of love: let it rather be a moving sea between the shores of your souls. Fill each other's cup but drink not from one cup. Give one another of your bread but eat not from the same loaf. Sing and dance together and be joyous, but let each one of you be alone." 12. 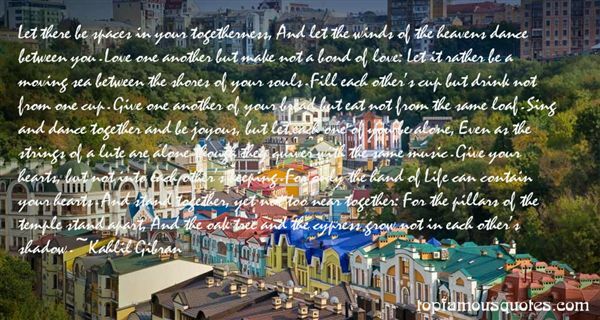 "Love one another, but make not a bond of love: let it rather be a moving sea between the shores of your souls. fill each other's cup but drink not from one cup. give one another of your bread but eat not from the same loaf sing and dance together and be joyous, but let each one of you be alone, even as the strings of a lute are alone though they quiver with the same music." 13. "Let there be spaces in your togetherness, And let the winds of the heavens dance between you. Love one another but make not a bond of love: Let it rather be a moving sea between the shores of your souls. Fill each other's cup but drink not from one cup. Give one another of your bread but eat not from the same loaf. Sing and dance together and be joyous, but let each one of you be alone, Even as the strings of a lute are alone though they quiver with the same music. Give your hearts, but not into each other's keeping. For only the hand of Life can contain your hearts. And stand together, yet not too near together: For the pillars of the temple stand apart, And the oak tree and the cypress grow not in each other's shadow." 14. "On Love and Happiness:When someone embarks on his research, if he ever makes it, (there is, in addition, a contingency that he/she will never embark on it), then he sails on a journey, a course that incubates various events.It's like opening a precious gift that hides myriads of secrets. Nobody acknowledges its content unless he attempts to inspect it.Happiness is not always dominated by heavenly chances, blue and green seashores of euphoria and pink clouds of serenity. Happiness does not dwell in luxurious mansions and expensive cars neither in glamorous appearances.Many times Unhappiness and loneliness lurk behind the ledges of luxury and surface brightness.There are so many examples around us, in newspapers, magazines, television and radio of people who are plunged in uncertainty, grief and insecurity.I wonder why this is." 15. "But let there be spaces in your togetherness and let the winds of the heavens dance between you. Love one another but make not a bond of love: let it rather be a moving sea between the shores of your souls." 16. "Judgment is more than skill. It sets forth on intellectual seas beyond the shores of hard indisputable factual information." 17. "In imagination she sailed over storied seas that wash the distant shining shores of "faëry lands forlorn," where lost Atlantis and Elysium lie, with the evening star for pilot, to the land of Heart's Desire. And she was richer in those dreams than in realities; for things seen pass away, but the things that are unseen are eternal." 18. "Had I told the seaWhat I felt for you,It would have left its shores,Its shells,Its fish,And followed me." 19. "Eventually man, too, found his way back to the sea. Standing on its shores, he must have looked out upon it with wonder and curiosity, compounded with an unconscious recognition of his lineage. He could not physically re-enter the ocean as the seals and whales had done. But over the centuries, with all the skill and ingenuity and reasoning powers of his mind, he has sought to explore and investigate even its most remote parts, so that he might re-enter it mentally and imaginatively." 20. "Upon the shadowy shore of death the sea of trouble casts no wave. Eyes that have been curtained by the everlasting dark, will never know again the burning touch of tears. Lips touched by eternal silence will never speak again the broken words of grief. Hearts of dust do not break. The dead do not weep. Within the tomb no veiled and weeping sorrow sits, and in the rayless gloom is crouched no shuddering fear.I think of those I have loved and lost as having returned to earth, as having become a part of the elemental wealth of the world – I think of them as unconscious dust, I dream of them as gurgling in the streams, floating in the clouds, bursting in the foam of light upon the shores of worlds..."
21. "Come, join your kin and lend strength to the weaker ones. Together, together, we journey, back to our beginnings and our endings. Gather, shore-born creatures of the sea, to return to the shores yet again. Bring your dreams of sky and wings; come to share the memories of our lives. Our time is come, our time is come. - She Who Remembers"
22. "They say that I am a poetI wonder what they would say if they saw me from the inside I bottleemotions and place them into the sea for others to unbottle ondistant shores I am unsure as to whether they ever reach and forthat matter as to whether I ever get my point acrossor my love"
23. "What seas what shores what grey rocks and what islandsWhat water lapping the bowAnd scent of pine and the woodthrush singing through the fogWhat images returnO my daughter"
24. "It is pleasant, when the sea is high and the winds are dashing the waves about, to watch from the shores the struggles of another." 25. "She says, "But in contentment I still feelThe need for imperishable bliss. "Death is the mother of beauty; hence from her,Alone, shall come fulfillment to our dreamsAnd our desires.Is there no change of death in paradise?Does ripe fruit never fall? or do the boughsHang always heavy in that perfect sky,Unchanging, yet so like our perishing earth,With rivers like our own that seek for seasThey never find, the same receding shoresThat never touch with inarticulate pang?" You know, I'd love to do a Maxim shoot. But I'm not going to do it, because that's just stupid to do."